A while ago, I linked to an interesting in-depth analysis of Netflix and pointed out some interesting things they had to say. Basic point: It seems that it is more costly to offer streaming content than it first appears. But, the article had some flaws, which makes me think that the author doesn't really understand the Netflix business model. Exhibit A is this graph, which is supposed to be an indictment on the selection that Netflix offers. 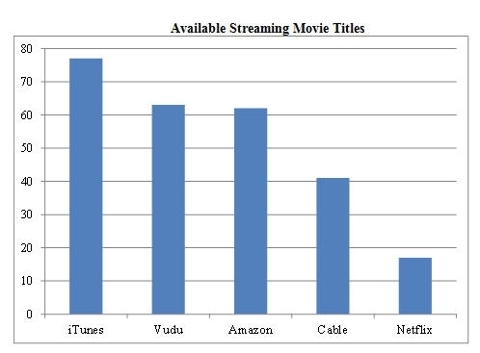 There is a similar graph for streaming TV shows, but the basic point remains. Netflix does not have the wide selection that other services offer. Look at the graph. What do you think? Should Netflix change its business model? Is change inevitable? I don't think it is. I look at this graph and think about all of the reasons why I do not watch on Comcast OnDemand, which has a free movies section. With Comcast, the selection is better than Netflix if you count the $5 movies, but most of the time, the only movies worth watching are the ones that cost $3 to $5. Even if I really want to watch that movie, I can wait a few months and see it for free on Netflix. That's the thing about Netflix. The selection of movies is surprisingly good if you make an apples-to-apples comparison to a similar service. Moreover, I am willing to conjecture that most people who use Netflix either don't mind waiting for a movie to come out later or enjoy older movies. The rest of this post is what Paul Krugman would call "wonkish"
Setting aside the issue of the selection that is offered, I think it is worth understanding the difference between the $5/movie rental model and the rent-all you want model. To a first approximation, the following graph has everything you need to know about this. A rental company will set the price such that marginal revenue equals marginal cost. Relative to open competition, they'll jack up the price to make profit. This will decrease quantity, but the decrease in quantity is worth it. For the $5 rental company, profit is illustrated as the green rectangle. Not bad for the rental company. And, the consumer gets the pink triangle in surplus. What does Netflix do differently? They give away all of their movies for free if you sign up for the monthly fee. 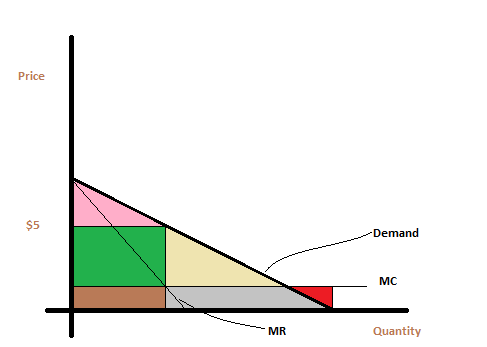 To a consumer, this service provides great value (value equal to the big triangle; pink, brown, green, grey and yellow areas). If there is no competition, this big multicolored triangle is how much Netflix could charge for the free-at the margin service. In this case, Netflix makes a killing. Profit equals "pink + green + yellow - red." If the red triangle is smaller than the pink and yellow areas, the Netflix model makes more profit. Now, that isn't a foregone conclusion because economics art isn't always drawn to scale, but there's a good chance that Netflix makes more profit in this story. There was a big "if" in my description of the Netflix pricing. No competition. That doesn't sound right. Well, what if Netflix faces competition from someone like Comcast who prices like a monopoly? In this case, Netflix can't charge the full multicolored triangle to each customer. It has to leave consumers at least the pink triangle of surplus in order to attract them to the monthly service. So, the monthly fee is slashed somewhat to "green + brown + yellow + gray" and Netflix profits are equal to "green + yellow - red." Result: Netflix makes more profit if the red triangle is smaller than the yellow one. Again, the way it is drawn, Netflix seems to be winning the battle of profits (but economics art is not drawn to scale). What I can tell you is that as marginal costs (the costs of producing another unit) decline, the Netflix model looks more attractive because the yellow triangle increases in size while the red triangle shrinks.